Cooking Simulator aims to deliver a truly authentic physics based cooking experience, with you able to put together a variety of culinary delights or just spend your time trashing your kitchen! There have been plenty of novelty cooking simulators released before, but Cooking Simulator looks set to introduce a much higher level of detail and authenticity to its culinary experience. In the game you’ll be let loose in a fully functional kitchen, with ovens, blenders, knives, pots, pans, microwaves, a wide variety of ingredients and a fire extinguisher (just in case). The aim of Cooking Simulator is to cook great dishes that will satisfy your client’s whims, gaining you social media reviews, new recipes and Michelin stars in the process. You’ll then have to combine all of your culinary skills to impress a mystery client – fail to please him and much of your hard work will be lost. You don’t have to focus on the cooking though – you have free reign to do with your kitchen as you please, including trashing it! There’s plenty of different ways you can amuse yourself, such as throwing knives at a dartboard, smashing windows with chairs, setting fire to boxes or even placing metal items in the microwave. 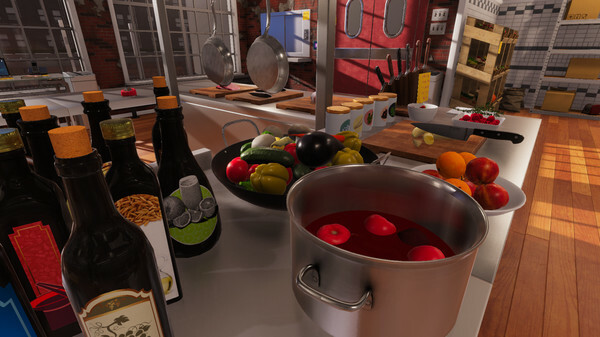 It’s a fun looking game, and whether you want to live out your dreams of becoming a world famous chef or just cause carnage in a physics-based kitchen environment, Cooking Simulator has you covered. Sign up for the Beta now to see what delights you can cook up!